Couples looking for an active and luxurious getaway should take a look at our snapshot of golf resorts that are as serious about spas and gastronomy as they are about the great game itself. These three domestic beauties are close to hearth and home – in the California wine country, on the rugged coast of Oregon, and on the shores of Wisconsin. Golfers, like the U.S. settlers, hit the East first, then went west. But skip over the well-known courses in southern Florida and the California desert. Some of the finest and best golf resorts today are now in Wisconsin, Oregon, and the foothills of California. These blazing hot American resorts rival anything Europe has to offer. This Midwestern gem is ranked among the top golf resorts and courses in the U.S. None other than the legendary Pete Dye designed its four championship golf courses. Blackwolf Run opened in 1988 with two courses, Meadow Valleys and The River, which are among the most challenging courses in North America. Both courses just reopened the greens after an extensive, two-year renovation. Blackwolf, which was formed from a glacial runoff, has hosted the World Championship and the U.S. Women’s Open, which it is also set to host again in 2012. Whistling Straits’ two courses, Straits and Irish, have played host to the PGA Championship, US Senior Open, and the Palmer Cup. It’s the newer of the two, but it is more classic in its appeal. It greeted golfers in ’98 with its two courses, the traditional links, walking-only course, Straits, and its inland course, Irish. The raw and rugged Whistling Straits is designed much like a true Irish links course, sculpted into the Lake Michigan shoreline, versus the rugged coast of Ireland. “If you close your eyes, you could swear you were in Ireland,” says Irish golfer Anna Donohue. With luxury-plumbing manufacturer Kohler at the helm, there is a high standard of excellence in every detail of this resort, from restrooms on the course, to the Kohler Waters Spa (ranked the No. 1 resort spa by the tony folks at Condé Nast Traveler), to the many restaurants onsite and at the American Club. To unwind from golf, you can opt for yoga, golf or one of 400 vintages at the Winery Bar, paired with award-winning cheeses exclusive to Wisconsin. For a rustic chic eat pop by The Lodge Restaurant. There’s an endless array of culinary and cocktail options in The Village of Kohler – a pitch-perfect place for the gourmet golfer. How to book: The American Club, the Midwest’s only AAA Five Diamond Resort overlooking an 11-acre lake, is your top choice for a chic retreat. For more casual accommodations, check in to The Inn on Woodlake. For more information and to make a reservation, call 800-344-2838 or visit the American Club Resort site. Bandon Dunes Resort boasts four courses: Bandon Dunes designed by Scottish architect David McClay; Pacific Dunes, designed by Tom Doak;, Bandon Trails, co-designed by Bill Coore and Ben Crenshaw; and the newest of the four courses, Old MacDonald, designed by Tom Doak and Jim Urbina, is a tribute to Charles Blair Macdonald (1856-1939), the father of American golf course architecture and founder of the U.S. Golf Association. Golf is the definitively first and foremost here as each of the courses are highly ranked. Bandon is built on the wild and rugged Oregon coast where weather and the elements change with each hole, shot, and hazard. This is in line with true links tradition, common in Europe, but quite rare in the U.S. It’s consistent with Ireland’s iconic Ballybunion or Scotland’s world-renowned St. Andrews. The players that pull in to this secluded, out-of the-way oasis, a short flight from Portland, are serious about their game. Great golfers welcome challenging yet fun golf courses. At Bandon, you are challenged and forced to be more creative, as the ball hits hard and fast or bumps and runs. Most guests, typically very athletic, stay at Bandon three or four nights and play four to six rounds of golf, a quick 18 when they arrive and 36 holes each day. This walking-only facility embraces the more personal caddy culture, so leave your fossil fuels behind. Postgame, you can pop in to The Gallery Restaurant for fine Pacific Northwest cuisine paired with world-class and locally sourced Oregon wines. Be sure to try the award-winning Oregon pinots, which are a bit spicier than their California counterparts. For a more Celtic kick, hit McKee’s Pub for microbrews, single malts, and pub grub. There’s no spa here; it’s all about the game. The peace you’ll feel is solely achieved from stepping onto this stunning course. At Bandon Dunes, it doesn’t matter if you win or lose. You just have to play the game. How to book: There are several accommodation options at Bandon. The epicenter of resort activity is The Lodge, with 17 rooms running $200 per night and four suites for $1,300 per night. Bandon Dunes Grove Cottages were designed with a foursome in mind. The four-bedroom cottages cost $1,800 a night and provide floor-to-ceiling corner windows, outdoor patio decks, and fireplaces in a garden or lake setting. Rooms are available at Chrome Lake from $390 a night, and two-bedroom, two-floor lofts run $600. 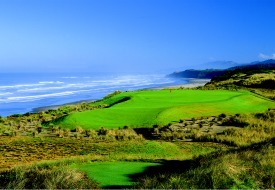 For more information and to make a reservation call 888-345-6008 or visit www.bandondunesgolf.com. Nestled in the foothills of the Santa Cruz Mountains in San Martin, just south of San Jose and north of The Monterey Peninsula, this 45-room Rosewood resort is a mere 30 minutes from Silicon Valley. Yet when you enter this sophisticated and secluded property on 1,700 acres of unspoiled land in Northern California, complete with a private winery and vineyard, you feel worlds away from any sense of civilization. Cordevalle’s Old World charm is perfectly paired with modern amenities and impeccable service. It’s modern in design and well-bunkered, with four sets of tees celebrating and supporting all levels of golf. The esteemed golf authority, Golf Digest previously ranked Cordevalle the No. 2 golf resort in California and No. 11 in North America. After a go at the greens, dip in to The Lions Peak Grill for casual California cuisine and cocktails until sunset. For evening eats the One Iron Bar just may be one of the sexiest 19th holes I’ve ever seen. How to book: There are several special offers available. Rosewood Escapes has room rates that start as low as $325 per room per night through 2011. With More Rosewood, stay two nights, get a third free or stay three and get your fourth and fifth free, and so on. Last, for those romantically inclined, opt for the Romance in The Valley Package. It includes a night’s accommodation, $100 resort credit per stay, rose petal turndown, continental breakfast daily, and wine tasting at Clos LaChance Winery. Rates start at $425 through 2011. 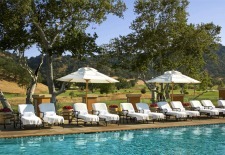 To make a reservation or for more information call 408-695-4500 or go to www.cordevalle.com. See our Oregon Travel Guide and California Travel Guide for more trip-planning information, then use our Travel Search price comparison tool to find the lowest rates on flights, hotels, packages, and more travel deals.